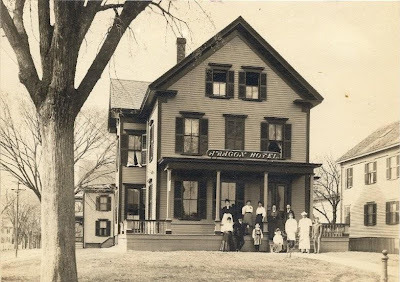 The Aragon Hotel operated on the corner of Center and Pearl Streets in Middleborough in the early 1900s, and was a successor to the Hotel Linwood and the earlier Tremont House. Despite the reputable look of its assembled staff in the photograph above, the Aragon (like many small hotels of the period) was a source for illicit alcohol and, as such, was subject to several liquor raids which hampered business. The illegal sale of alcohol led to the demise of the hotel which closed in 1908. The building still stands, however, in its original location. 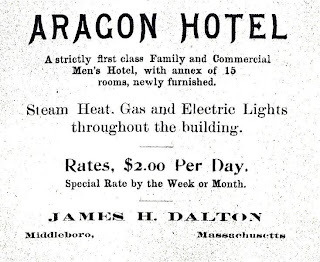 Aragon Hotel advertisement, Resident and Business Directory of Middleboro and Lakeville, Mass. (Boston, MA: Edward A. Jones, 1904).